Over the last four or five months I have greatly increased the amount of books I have been reading. Starting a book club with Jessica and several friends was a great idea. I have always loved reading but several years ago it greatly tampered off because I never made time for it. When the idea of starting a book club came to me I immediately thought that at least I would be reading one book a month but it has rubbed off and now I finish several books each month. For our February book club meeting our friend choose this book but I hope to also work my way through the other books above in the next couple months. What are you currently reading? I have read the Agatha Christie and it is unputdownable! Oh I want to read so many of these! My vacation needs to hurry up since i literally only have time to read on vacation. 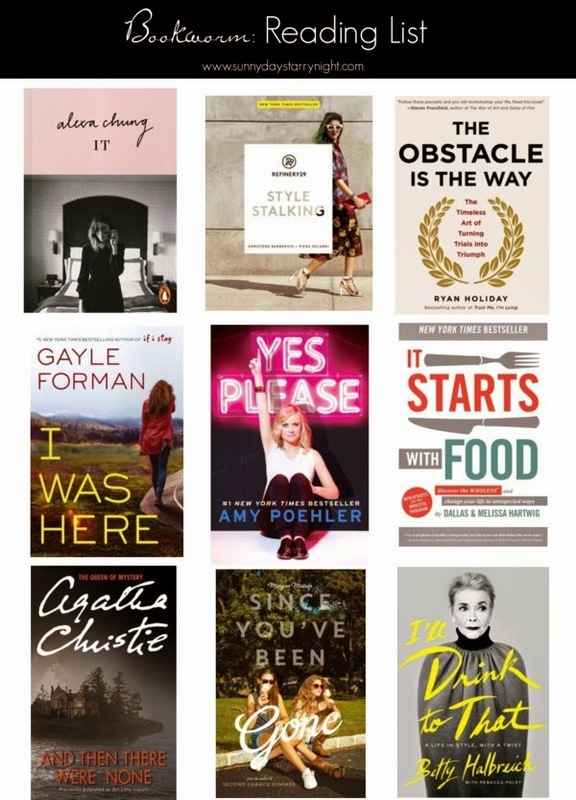 But Amy Poehler's book is at the top of my list. Currently reading The Glitter Plan (by the founders of Juicy Couture); I think you will love this book. It's about how 2 friends had a dream and did it their way (which was usually against the advice of all the experts). Also reading 'Thunk' and The Power of Now (which I am really struggling with).